As the results of the New Hampshire Presidential Primary roll in, I’d like to take this opportunity to reflect upon fantasy basketball as an analogy for life, filtered through the lens of the 2008 Presidential race. That’s what I’m trying to do here. Does my fantasy team (“The Centerfolds”) really matter that much in the grand scheme of things? They’re a bunch of the nicest guys in the league, and they’re trying to show the world that you don’t need to have a criminal record to succeed in the NBA. But after this season, and after this fantasy basketball experiment is over, our country will still have to face all of the same problems as today. I’ve spent all season spouting off about Yao’s rebounds, Ray Allen’s 3-pointers, and Andrew Bynum’s surprisingly gutsy play. But we’ve got more important things to talk about. We’ve got potentially world-changing events taking place, even as I write this. Sure, there’s a war in Iraq. Yes, Iran still gets a bit uppity from time to time. And don’t forget about the writers’ strike - its effects clearly evident from the onslaught of reality TV pouring down upon us like an amber wave of grain. So let’s take a moment, and step back from the world of fantasy basketball. You’ve caught me at a good time. Normally I’d say there isn’t anything more important than fantasy sports. After all, fantasy sports cause no permanent injuries. 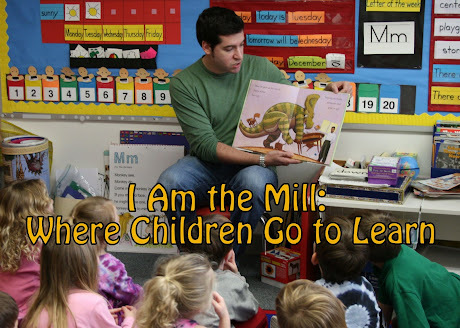 They help children learn the value of salary caps and smart roster moves. They bring families together, and reunite long-lost friends across miles and miles of land or sea. Essentially, fantasy sports know no boundaries. And that’s exactly what we need for our country. We need to expand our horizons, and open our borders - both mentally and physically. We need politicians from both sides of the aisle to work together as a team. Team USA. Let’s start with Mitt Romney, one of the taller candidates. Romney’s not only tall, but he’s also athletic, and distractingly handsome. I’d elect him as a fine Small Forward on my political fantasy basketball team. Hillary Clinton might not be able to drive the lane, or post up with any of the big boys. But I bet she could rain threes like Hardaway in his heyday. Not a bad candidate for Shooting Guard, if you ask me. 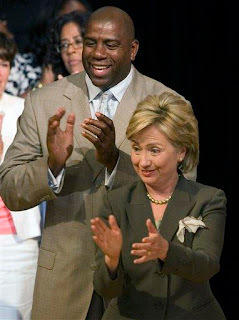 Hillary, after 4 grueling weeks at Magic Johnson's fantasy basketball training camp. And Barack Obama - a silky smooth orator, with (I suspect) a ridiculous cross-over dribble that would leave opponents staring at their own shoes. He could play a few different positions, but I’d pencil him in as my starting Point Guard. He knows a lot about listening to different points of view and bringing people together. He should be able to pass the ball pretty well too, I’d imagine. That still leaves me with a gaping hole in the middle of my lineup. What political leader is big enough, metaphorically speaking, to fill the massive shoes of a Shaq or a Yao? Who could be my fantasy basketball-politics Center? Nah. He’s way too short. And too darn scrappy. He’d make a better sixth man - coming off the bench to give you a nice change of pace to the deadly accurate shooting of Hillary, or the slick play of Mitt. I’m not feelin’ that one either. He might be a good back-up to Obama at the point. People seem to like him. Seems like he’d be an accurate passer, and a decent leader on the floor. But not on my first team. Give him some major minutes, but not the starting job. Well, if it weren’t for the fact that he just dropped out of the race, he wouldn’t be a bad choice. A big, imposing voice in the middle. He’d probably shout a lot, and intimidate the other team. But again, this choice is irrelevant. We’re only dealing with individuals who are still in the Presidential race right now. I live in New York. I’ve been here for several years, and love this city. 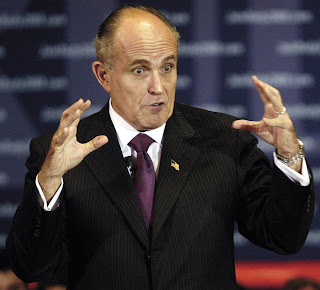 So I’d be remiss if I didn’t at least consider Rudy Giuliani for the position. He’s a tough guy, no doubt about it. He’s pretty tall in real life, and he’s got exactly the right bulldog personality to get in the trenches and fight for the rebound. You know he’s not afraid to throw an elbow or two. My only hesitation? The man has no lips. He has a nose, a chin, ears, and eyebrows. But no lips. Take a closer look next time you see him. For some strange reason, I just don’t trust people without lips. They seem to lack emotions. I don’t know. Call me crazy, but Rudy’s not my guy. 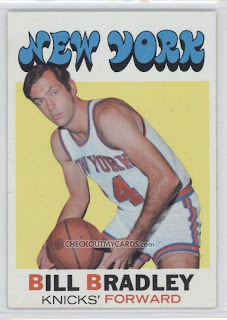 Maybe I’d play him at Power Forward, but not Center. That leaves only one legitimate possibility for the Center position on my team. He’s an outsider - an independent. He takes orders from no single political party. Again, as a New Yorker, I have to give him fair consideration. He’s actually the shortest candidate, physically speaking, in the entire field. Although he hasn’t technically announced his candidacy yet, I’m holding out hope. And when he does finally decide to make a run for the White House, I’ll be ready to plug him right into my starting lineup. Why Bloomberg? He’s got guts, he’s smart, and he possesses an absolutely insane vertical leap, that more than makes up for his lack of height. I wish this guy was a candidate again. That would be a no-brainer.